The Phoenix Society is the leading national nonprofit organization dedicated to empowering anyone affected by a burn injury through peer support, education, and advocacy. For more than 30 years, the Society has partnered with survivors, families, health care professionals, burn centers and the fire industry to support recovery and improve the quality of burn care and prevent burn injury. Based in Grand Rapids, Michigan, the Society is committed to advancing recovery resources, providing environments to renew the spirit and to supporting a positive return to life. In 2001 the Phoenix Society introduced the Survivors Offering Assistance Recovery (SOAR) program. It has helped to qualify and validate the peer support that had previously been provided on an informal basis. There are currently over 50 burn centers in the process of implementing a SOAR program. Sarah was an informal volunteer, and then became a trained SOAR volunteer in 2001 at Regions Hospital in St. Paul, MN. As a SOAR volunteer, Sarah has worked with countless patients and family members. Many of the survivors Sarah has worked with have left an impact on her, but there is one in particular whom Sarah will never forget--a teenaged burn survivor named Elaina. Elaina had been badly burned in an explosion and then abandoned by her family while in the burn unit. She and Sarah had an immediate bond. Elaina enjoyed two trips from the burn unit before being released to a foster home and both visits were spent with Sarah and her family. Elaina was excited about her foster family and her new start on life, but sadly she died in her sleep just days after moving into her foster home. Sarah and the foster mom both received burial blankets from the tribe that Elaina came from. The tribal elders wanted to show their appreciation to the two women who had stepped up to care for Elaina. Being a SOAR volunteer requires an emotional investment, but this experience was exceptionally difficult for Sarah. 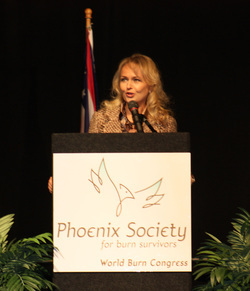 Each year the Phoenix Society hosts the World Burn Congress. This is an international conference that brings together nearly 1,000 burn survivors, their families, care givers, burn care professionals and firefighters. It is a forum in which we encourage and facilitate the sharing of stories, provide support and increase knowledge of burn recovery. For many it is the first opportunity to meet and share with others who have experienced a burn trauma. In 2011 Sarah was the keynote speaker. Recovery (SOAR) volunteer for the Phoenix Society for Burn Survivors.